The Winnower | What Predicts Genetic Diversity? A study published by Nature in 2014 linked genetics to ecology to find the answer to an old puzzle. Until then researchers across the world were not sure of what determined the genetic diversity of species, that is, the variety of sequences that we can find in the DNA from different individuals of a same species. Genetic diversity is important as a way of providing a framework for evolution and environmental adaptation. Predicting this simple concept can profoundly impact the management and conservation strategies of species, as we will explain later on. To find out the determinants of genetic diversity, J. Romiguier et. al sequenced and analysed the transcriptomes (the expression of all genes in a given time) of 76 animal species that are not normally used in this kind os study, non-model animal species, filling the gap of unexplored organisms that traditional research passed over. They analysed the data of two to ten individuals of each species, covering the levels of polymorphism (variants of a DNA sequence) across the whole metazoan tree of life. The authors measured an index to genetic diversity, synonymous nucleotide diversity (πs), comparing the number of differences between two sequences at a given position. They observed no strong correlation between πs and geography-related variants, such as distance to Equator, population structure, invasive status and marine or terrestrial environment. On the other hand, when they looked into life-history traits (adult size, body mass, longevity, dispersion ability, fecundity and propagule size which is the size the younglings are born) they found strong correlations. Propagule size was the variable that best predicted the nucleotide diversity measured across species. Adult size did not present such a strong correlation, probably because species with lower genetic diversity had body sizes ranging from less than 1 cm to more than 1 m. What linked all those studied species together, marine and terrestrial alike, was a large parental investment in offspring, which corresponds to propagule size. The smaller the size of the propagule (e.g. eggs, larvae), the shorter the time of parental investment. 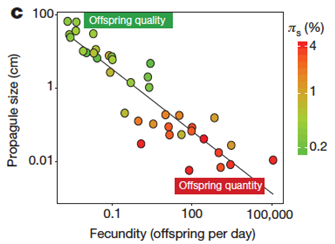 The authors also found the relationship between offspring quantity (fecundity) and offspring quality (propagule size) is the most defining feature when it comes to genetic diversity. K-strategists opt for quality and have smaller number of offspring, while r-strategists opt for larger offspring quantity with “lower quality”. These show higher levels of genetic diversity (as shown in the graph below). This feature could be explained by higher rates of mutation and random recombination in r-strategists while producing more offspring, but scientific data seems to support the opposite. Image: Higher genetic diversity levels (πs) are present in species that favour offspring quantity over offspring quality. Romiguier et al, 2014. This papers shows that when it comes to genetic diversity, life-history strategies are key determinants that should influence conservational policies. Despite that many targeted animals in conservation strategies are K-strategists, many invertebrates are not covered by those, even though they also present larger parental investment and lower levels of genetic diversity to overcome environmental challenges. Populations of K-strategists shouldn’t be isolated from one another, since gene flow (the movement of genetic variants across populations) is their main way of creating diversity. Reversely, many r-strategists should also be included in conservational policies. Because their levels of genetic diversity remain high regardless of the circumstances, it could mask the species’ actual risk. In this case, they could have their populations declining and still maintain a high genetic diversity level. All in all, this study opened a promissory path to connect genetic research and conservation ecology to preserve species worldwide.